GoToAssist is a robust, cloud-based solution that allows you to connect to a customer's desktop computer or mobile device to provide real-time support - anytime, anywhere! Do you host support sessions from a Windows computer? Check out the Agent Quick Start Guide for Windows. Create an account by signing up for a free trial. Log in to your account from your desktop computer to access the web app. Install the desktop app on your Mac computer. I received an invitation to join GoToAssist. What next? Welcome to GoToAssist! To set up your new account, click the URL in the email invitation, then create a password to log in. Learn more. If you have forgotten your password or need to reset it, go to Password Recovery, enter your email address, then click Send an email to reset your password. Learn more. Where can I download the installation package? You can download the latest version of GoToAssist for Windows or Mac here, or by logging in to your account and downloading from the web app. What is included in the installation package? Where can I find step-by-step installation instructions? You can view a full set of instructions for installing the agent desktop app on Windows and Mac. System requirements for all agent applications can be found here. You can use GoToAssist to help facilitate support sessions with your customers in a variety of ways. Once logged in at http://up.gotoassist.com, you can access the web app to view and connect to your devices, as well as download the desktop and unattended installer apps to host support sessions. The web app is an online support tool that you access from a web browser on your desktop computer when you log in to http://up.gotoassist.com. The web app consists of 4 components displayed as tabs in the top navigation: Dashboard, Devices, Recordings, and Reporting. What is the desktop app? The desktop app is the agent software that you can download and install on your Windows or Mac desktop computer to host attended and unattended support sessions with customers. What is the unattended installer app? 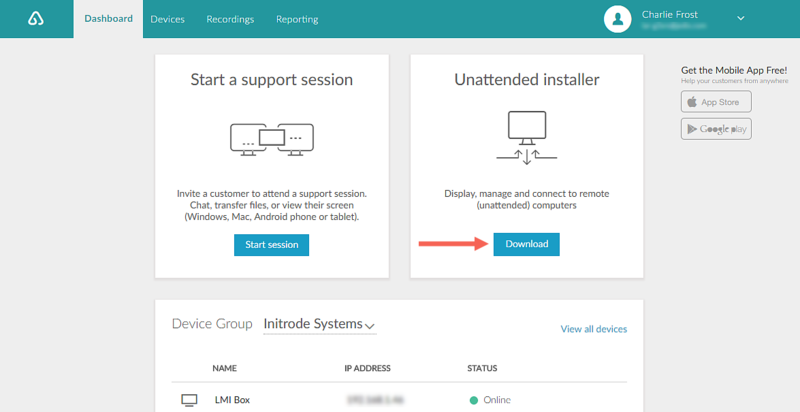 The unattended installer app is the customer software that you can download and install on a computer that grants you the ability to connect to that device anytime. It is called "unattended" because the customer does not have to be present at their computer to enter a support key and join your support session. Once you have set up unattended access, you can use the agent desktop app to start an unattended support session and connect to that device. The agent desktop app is used for hosting attended support sessions and inviting your customers to join. Attended support sessions are those in which a customer is at their computer or on a mobile device to join the session with the agent using a support key (i.e., the supported computer or mobile device is "attended" by the customer). Agents can use their desktop computer or mobile device to host attended support sessions using the agent application. Install the GoToAssist agent desktop application. Open the application on your computer. Log in with your agent email address and password. Go to Session > Start Session from within the application, or right-click on the application's system tray icon and select Start Support Session. Install the GoToAssist (Remote Support) app for iOS or Android. Open the app on your mobile device. Tap on the screen to start a new support session. There are various ways in which you can invite your customer to join your support session, depending on whether they are joining from a desktop computer or a mobile device. Learn more. 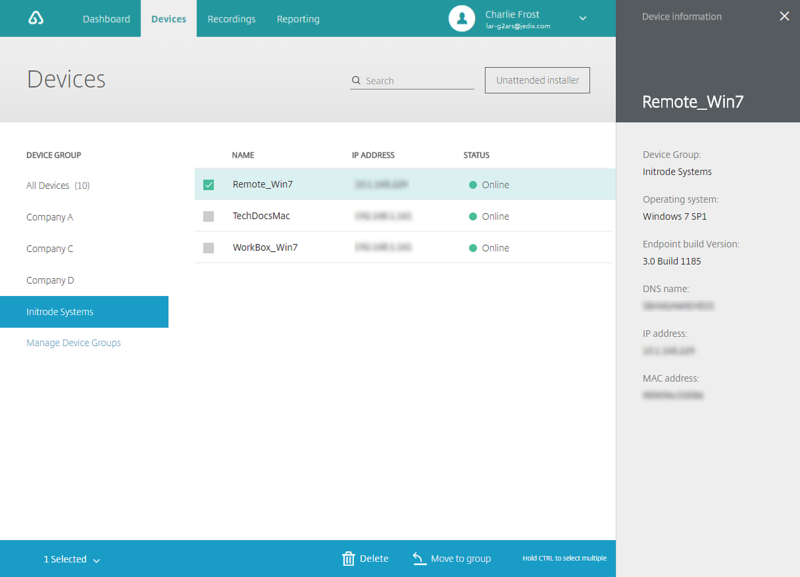 You can set up unattended support on a customer's desktop computer so you can connect in a support session without their presence at the local computer. Unattended support sessions are those in which the agent can access their customer's computer while they are not presently in front of it, meaning the customer's computer is "unattended." Agents can use their desktop computer or mobile device to connect to unattended machines. What are the system requirements for setting up unattended access? System requirements for using the agent application (to connect to an unattended support session) can be found here. System requirements for all customer applications (including unattended access) can be found here. Why isn't access to unattended support available within my account? 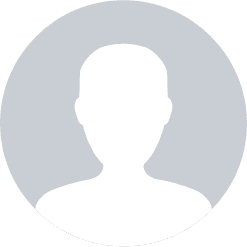 The admin can disable unattended access within their account's group or user settings. When disabled, the agent will not have the option to set up or access unattended computers. The agent will also not see devices listed on the Dashboard or Devices pages within the web app. You can set up unattended access in several ways, depending on whether you are presently on site with the computer or at a remote location. Learn more. Set up unattended access on a device. Go to Unattended Support > View Unattended Computers. Locate your desired computer, then click Connect. Tap Unattended Support (iOS) or Unattended Computers (Android). Locate your desired computer, then tap to select it. During a support session, there are several features & tools that are available to both agents and customers to help provide the best possible support experience. During a support session, the agent can view the screen of their customer's desktop computer or mobile device, with the customer's permission granted. At any time during the session, the customer can stop sharing their screen. Learn more. Why isn't remote control available during my screen sharing session? The admin can disable the use of remote control during a screen sharing support session within their account's group or user settings. Agents and customers can use file transfer to send each other files that need to be locally stored on each other's computers. Learn more. Why isn't file transfer available during my support session? The admin can disable the use of file transfer within their account's group or user settings. Agents can use drawing tools to highlight key areas on the customer's screen and bring a customer's focal point into view during their support session. Learn more. Are drawing tools supported for both Windows and Mac? No. 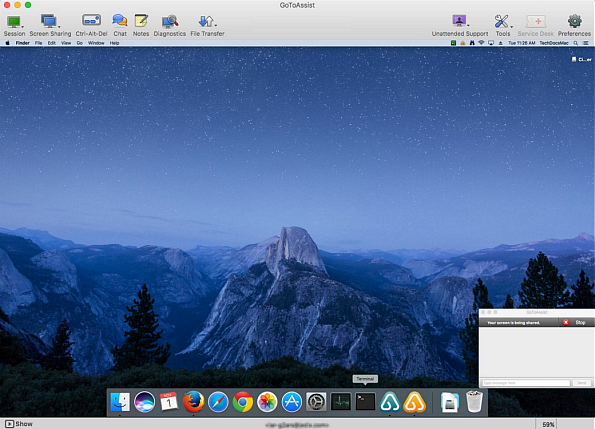 Drawing tools are not supported on Mac, and can only be used when an agent is hosting a support session from a Windows computer and connected to a Windows customer. Agents and customers can use the chat feature to send messages back and forth to aid each other during their support session. Learn more. *Tools can only be used when connected to a Windows customer computer. The first page you see after you log in to your account is your Dashboard, where you can launch a new support session, download unattended installers, and oversee your device groups and unattended machine statuses. Learn more. You can oversee, maintain, and access all of your unattended support computers. Learn more. You can browse all recorded screen sharing support sessions and download them for viewing within 90 days of their creation date. Learn more. You can generate session reports to view detailed descriptions about past support sessions within specified date ranges. Learn more.